Hand Operated Plastic Bag HeatSealers, Foot Pedal Operated Heat Sealers and Vacuum Sealers are available to seal virtually any application. Heat sealers are used to seal many packaging products from food, pharmaceutical, hardware and other materials into thermoplastic plastic bags. 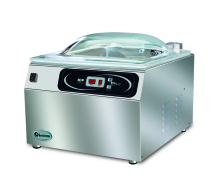 The heat sealed packaging ensures that your product is tamper proof, air and water tight and hygienic. Impulse Heat Sealers and Constant Heat Sealers both types of machines and are available as a hand heat sealer, portable hand held sealer, foot heat sealer, industrial heat sealer and band sealers. Impulse heat sealing machines or bag sealers have one or two heating elements which are covered by a layer of PTFE Teflon fabric type material which prevents the bag sticking to the sealer. Foot pedal sealers are great for low to medium usage they allow sealing to be operated with hands free to aid lifting or positioning your product. Heating elements are not continuously heated; heat is only applied when the jaws are closed and current flows. When the bag is placed in the impulse heat sealer, the jaws are closed and pressure maintained for the time of the seal (while the light is on). Then pressure is held to allow the seal to cool. 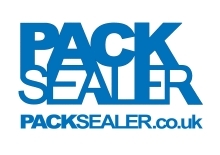 Double Foot Operated Impulse Sealers have a heating element on both the top and bottom jaws which makes these sealers suitable for thicker material and industrial use. The jaws of direct heat sealers or constant heat sealers heat up to pre set temperatures and are better suited for bags and packaging products having different properties and melting points, such as; foils (side gusseted foil coffee pouches), waxed, coated papers, cellophane and polypropylene laminates. 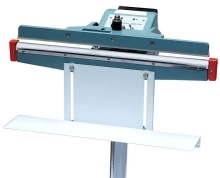 Many direct heat sealers are Crimp Heat Sealers giving a deeper seal of more than 10mm and are for increased strength. If you require an industrial sealer the semi-automated heat sealer machine the Continuous band sealers can provide the solution which operate with a conveyor system for high volumes. Internal or chamber vacume sealers; the bag is placed inside the chamber where air is removed using a vacuum pump, ideal for smaller products. External, nozzle or probe type machines are ideal for larger plastic bags. Packsealer offers guidance in choosing the right heat sealer machine for your packaging, send a sample bag and they will test it. They hold a full range of spares for our own machines and other similar for ongoing support.